Parents are weeping and crying out to God. All they want is for their child to survive through the night so that they can tell him how proud of him they are. They wonder why God would allow such a car accident to happen yet they still believe and have “faith,” that God will bring their child through. That somehow God will help their child survive and they will see their son open his eyes again. They have “faith” that they will see their son graduate, get married and have children. Then the unthinkable happens- alarms begin to sound and their son is no longer living. Now their “faith” turns to anger and resentment as the core of who they are is shaken. They can no longer follow a God who allowed their son to die. A God who, despite their faith, didn’t answer their prayers. How many of us know someone who has been hurt or scarred so deeply because they felt like God abandoned them? They felt that despite their faith- God chose to turn His back on them. I believe at the core of this struggle is a fundamental question- what is faith? Recently I have been studying with a men’s group about what faith is and what it is not. 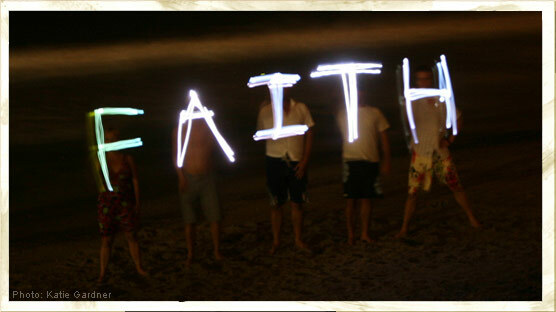 It has truly gotten my mind working and pondering on this idea of, what is real faith? The picture I painted above about the family’s faith in a desperate time is a snapshot of a faith that truly isn’t a faith at all. In fact the family is experiencing hope, not faith. So what is faith? It should first be noted that we are talking about true biblical faith in God. There are other kinds of faith but they are not the type of faith that God commends in Hebrews 11. Since Hebrews 11:1 is the go to definition for faith we will begin by looking at that verse. First we should notice that faith and hope are two different things. They are connected but they are also different. In part one of the verse we see that faith is a confidence in what we hope for. I can send my wife a text message asking her to bring Taco Bell home for dinner. If she doesn’t respond then I am only hoping that she will bring home tacos. Ultimately my confidence in the eating of Taco Bell is only hope, not faith. Why is it not faith? I cannot have faith in eating Taco Bell because Ashley never responded. I am only hoping she got my message and I am only hoping that she will pick up the food. You see, faith is more than just hoping. The component of the verse that helps us to understand faith is the second part, “assurance.” Where does assurance come from? It comes from the promises of God. Faith is not just what we hope for, rather, it is what God has promised us. Biblical faith is the marriage of God’s promise with our hope. I can have faith that I will eat Taco Bell once Ashley responds and tells me that she will pick it up. Once she tells me that she is picking up tacos then my hope becomes faith. Faith is hope with a promise. In the above story, the parents can hope all day long that their son will be healthy again but God did not promise that he would. So their “faith” that God would heal their son is not really faith because God never promised He would heal him. Their “faith” is in fact nothing more than hope. Hope does and can come out of true faith but faith can never come out of only hope. I have faith that Jesus is the Son of God because it has been promised to me in the Bible. In Genesis God promised Abram a child so Abram hoped for and had faith that God would give him a child. The hope was accompanied by a promise therefore it became faith. The difference between faith and hope is that faith comes with a promise from God. We cannot expect things from God that He did not promise. Now God can do things that He doesn’t promise but we cannot expect them. So for us to expect or to think that we can have strong enough faith for God to heal our loved one is wrong. It leads us to get mad at God when we are the ones mistaken. The next time you are faced with a situation that is challenging, painful, stressful or seemingly impossible- may you remember that hope is acceptable but it is not faith unless God has made a promise. Wait, how do we know what He has promised? Check back in a few days as we explore how we can know what God promises. Until then, I’ll be eating some tacos! This is a very good post, I have a question where do miracles come in the midst of faith and hope. That is a very good question and one that is post worthy! Check back in a few days and I, to the best of my ability, will answer your question.